Much like the SMART self-test capabilities found on ATA drives, NVMe now defines an optional interface for the host system to instruct the drive to perform a self test. The details of what is tested are left up to the drive vendor, but drives should implement both short (no more than two minutes) and extended self tests that may include reading and writing to all or part of the storage media but must preserve user data and the drive must remain operational during the test (either by performing the test in the background or by pausing the test to service other IO requests). For the extended test, drives must offer an estimate of how long the test will take and provide a progress indicator during the test. Borrowing a feature from eMMC, NVMe 1.3 introduces support for boot partitions that can be accessed using a minimal subset of the NVMe protocol, without requiring the host to allocate and configure the admin or command queues. Boot Partitions are intended to reduce or eliminate the need for the host system to include another storage device such as a SPI flash to store the boot firmware (such as a UEFI implementation). Drives implementing the Boot Partition feature will include a pair of boot partitions to allow for safe firmware updates that write to the secondary partition and verify the data before swapping which partition is active. The boot partition feature is unlikely to be useful or ever implemented on user-upgradable drives, but it provides an opportunity for cost savings in embedded systems like smartphones and tablets, which are increasingly turning to NVMe BGA SSDs for high-performance storage. The boot partitions can also be made tamper resistant using the Replay Protected Memory Block feature that was introduced in NVMe 1.2. The new optional Sanitize feature set is another import from other storage standards; it is already available for SATA and SAS drives. The Sanitize command is an alternative to existing secure erase capabilities that makes stronger guarantees about data security by ensuring that user data is not only removed from the drive's media but from all of its caches, and the Controller Memory Buffer (if supported) is also wiped. The Sanitize command also lets the host be more explicit in specifying how the data is destroyed: through block erase operations, overwriting, or destroying the encryption key. (Drives may not support all three methods.) Current NVMe SSDs offer secure erase functionality through the Format NVM command, which exists primarily to support switching the block format from eg. 512 byte sectors to 4kB sectors, but can also optionally perform a secure erase in the process. While the Format NVM command's scope can be restricted to a particular namespace attached to the NVMe controller, the Sanitize command is always global and wipes the entire drive (save for boot partitions and the replay protected memory block, if implemented). 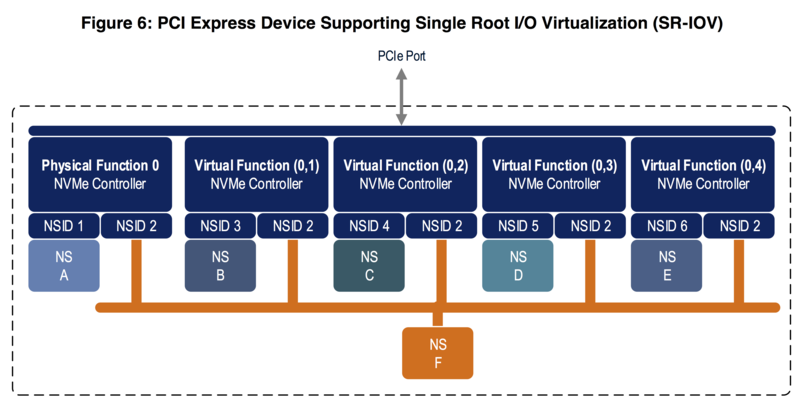 Previous versions of the NVMe specification allowed for controllers to support virtualization through Single Root I/O Virtualization (SR-IOV) but left the implementation details unspecified. Version 1.3 introduces a standard virtualization feature set that defines how SR-IOV capabilities can be configured and used. NVMe SSDs supporting the new virtualization enhancements will expose a primary controller as a SR-IOV physical function and one or more secondary controllers as SR-IOV virtual functions that can be assigned to virtual machines. (Strictly speaking, drives could implement the NVMe virtualization enhancements without supporting SR-IOV, but this is unlikely to happen.) The SSDs will have a pool of flexible resources (completion queues, submission queues and MSI-X interrupt vectors) that can be allocated to the drive's primary or secondary controllers. The NVMe virtualization enhancements greatly expand the usefulness of the existing NVMe namespace management features. So far, drives supporting multiple namespaces have been quite rare so the namespace features have mostly applied to multipath and NVMe over Fabrics use cases. Now, a single drive can use multiple namespaces to partition its storage among several virtual controllers assigned to different VMs, with the potential for namespaces to be exclusive or shared among VMs, all without requiring any changes to the NVMe drivers in the guest operating systems and without requiring the hypervisor to implement its own volume management layer. NVMe allows SSDs to support multiple sector sizes through the Format NVM command. Most SSDs default to 512-byte logical blocks but also support 4kB logical blocks, often with better performance. However, for flash-based SSDs, neither common sector size reflects the real page or block sizes of the underlying flash memory. Nobody is particularly interested in switching to the 16kB or larger sector sizes that would be necessary to match page sizes of modern 3D NAND flash, but there is potential for better performance if operating systems align I/O to the real page size. NVMe 1.3 introduces a Namespace Optimal IO Boundary field that provides exactly this performance hint to the host system, expressed as a multiple of the sector size (eg. 512B or 4kB). The new feature that may prove to have the biggest long-term impact is NVMe's Directives support, a generic framework for the controller and host system to exchange extra metadata in the headers of ordinary NVMe commands. For now, the only type of directive supported for ordinary IO commands is the Streams directive. Defined only for write commands, the streams directive allows the host to tag operations as related, such as originating from the same process or virtual machine. This serves as a hint to the controller about how to store that data on a physical level. For example, if multiple streams are actively writing simultaneously, the controller would probably want to write data from each stream contiguously rather than interleave writes from multiple streams into writes to the same physical page erase block. This can lead to more consistent write performance for multithreaded workloads, better prefetching for reads, and lower write amplification. NVMe power management is far more flexible than what SATA drives support. NVMe drives can declare several different power states including multiple operational and non-operational idle states. The drive can provide the host with information about the maximum power draw in each state, the latency to enter and leave each state, and the relative performance of the various operational power states. For drives supporting the optional Autonomous Power State Transitions feature (APST) introduced in NVMe 1.1, the host system can in turn provide the drive with rules about how long it should wait before descending to the next lower power state. NVMe 1.3 provides two significant enhancements to power management. The first is a very simple but crucial switch controlling whether a drive in an idle state may exceed the idle power limits to perform background processing like garbage collection. Battery-powered devices seeking to maximize standby time would likely want to disable this permissive mode. Systems that are not operating under strict power limits and are merely trying to minimize unnecessary power use without prohibiting garbage collection would likely want to enable permissive mode rather than leave the drive in a low-power operational state. The second major addition to the NVMe power management feature set is Host Controlled Thermal Management. Until now, the temperatures at which NVMe SSDs engage thermal throttling have been entirely model-specific and are not exposed to the host system. The new host controlled thermal management feature allows the host system to specify two temperature thresholds at which the drive should perform light and heavy throttling to reduce the drive's temperature. Most of the details of thermal throttling are still left up to the vendor, including how the drive's various temperature sensors are combined to form the Composite Temperature that the thresholds apply to, and the hysteresis of the throttling (how far below the threshold the temperature must fall before throttling ceases). Drives will continue to include their own built-in temperature limits to prevent damage, but now compact machines like smartphones, tablets and ultrabooks can prevent their SSD from raising other components to undesirable temperatures. GJ Billy, it was a long time since I saw such high quality articles on Anandtech. While I agree with your view that this article is indeed very nicely written, I would very respectfully like to disagree with the notion that the quality of articles or analysis on this website has gone down in any way since the great Anand Shimpi left. There is no doubt about the quality of Anand's articles and this website itself is a tribute to his impeccable style of tech journalism, however, times have changed since he first started writing or even from 2012-13, when Anand still actively wrote articles. 1.) The focus of the tech industry has changed. I don't see people talking about RGB lighting on the motherboards and keyboards as much in 2010 as now and that trickles down to the articles as well. 2.) Things are always getting more and more complex. Take any product in any category and you will find that they are always more complex than their counterparts in 2010-12 from motherboards to mobile devices everything. While it would be great to talk about all the things and analyze them, I think every writer makes a conscious decision of limiting the amount of material in the article and prioritizing a few things over the other. The reason, for me, is usually that not all readers would want to or have patience/stamina to read everything. 3.) Tech companies while having indulged in customer engagement more have grown more and more secretive in sharing the details of the their projects which doesn't help if you are writing an analytical article on new technology. 4.) While there are numerous product launches and events which all amounts to a frenzied pace of events and activities for the writers, the actual changes have been coming in smaller and smaller increments themselves. Companies are sticking with the tried and tested components and only tweaking few things at a time. Now regardless of whether someone agrees or disagrees with this approach, it does result in lesser material to write about. Any idea when we will see this on motherboards?